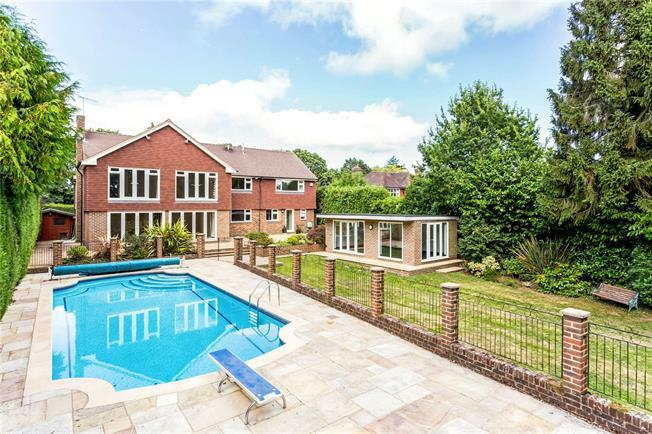 6 Bedroom Detached House For Sale in Tunbridge Wells for Asking Price £1,500,000. • Double doors open into the spacious triple aspect drawing room which has a Jetmaster wood burning fireplace with stone surround, two sets of bi-fold doors open onto the rear terrace. A dining room with fitted cupboards and outlooks to the front and a sitting room with outlooks to the front. • The bespoke well fitted and equipped kitchen/breakfast room has an extensive range of wall and base units arranged in an L shape with long granite work surfaces, a large island unit with cupboards below and a good range of integrated appliances. Rear hallway from the kitchen incorporating access to the garden, shower room, utility room, large bedroom and rear staircase (which provides a future opportunity for annexe accommodation). • To the first floor there are five bedrooms (with four en suites and a family bathroom) and a spacious L shaped galleried landing. The principal bedroom has lovely outlooks over the garden from the Juliet balcony and fitted wardrobes. All the remaining bedrooms are a good size, one has a mezzanine level with eaves storage and another has a further Juliet balcony. The house is tucked away in an excellent location in the village on Holmewood Ridge, one of the most highly regarded private roads in the Tunbridge Wells area. There are local shops, a primary school, church, pub and the highly regarded Holmewood House Preparatory School. Langton Green is within easy reach of Tunbridge Wells, about 2 miles away, for comprehensive shopping facilities, including the Royal Victoria Place Shopping Centre, for many major national stores and a wide variety of individual shops. The area is renowned for its excellent schools, and in particular, grammar schools for girls and boys in Tunbridge Wells, as well as the Skinners school etc. To the front, the driveway which is flanked by evergreen hedging and lawn provides parking for several vehicles and leads to the detached garage and side access to the rear terrace/garden. The landscaped south facing rear garden is mainly laid to lawn along with a wide selection of shrubs, a large oak tree and hedging to both the sides providing good levels of privacy. Directly adjoining the house the superb paved terrace and to the side is a fenced area for the swimming pool which is heated via an air source heat pump together with a brick built summerhouse/home office.